Dubai, United Arab Emirates, 28 November 2017 – The inaugural address at the 12th Annual GPCA Forum was delivered by H.E. Khalid A. Al-Falih, Minister of Energy, Industry and Mineral Resources, Saudi Arabia, who called for the industry to embrace rapid changes within the global energy landscape as an opportunity. The Forum is taking place between 27-29 November 2017 at Madinat Jumeirah, Dubai, under the theme ‘the chemical industry in transformation: a new journey begins’. Introducing the Forum was Yousef Al-Benyan, Vice Chairman and CEO, SABIC and Chairman, GPCA, who delivered the opening welcome address. His Excellency Suhail Al Mazrouei, Minister of Energy, UAE, was among the dignitaries attending the forum. With global chemicals demand expected to more than double by 2030, the industry must brace itself for rapid technology disruption in an evolving energy landscape. There is a strong need for industry consolidation as newer players emerge and global trade practices and regulations change faster than ever. It is time for regional players to think global while maintaining their local edge as game changing technologies take hold. “The downstream industry has come a long way and producers in the region are well-placed to leverage the opportunities for value creation and further portfolio diversification. I applaud the catalytic role that GPCA has played in driving the growth of the regional chemical sector, bringing the industry together to deliberate issues of great industry significance and taking the industry forward,” he continued. 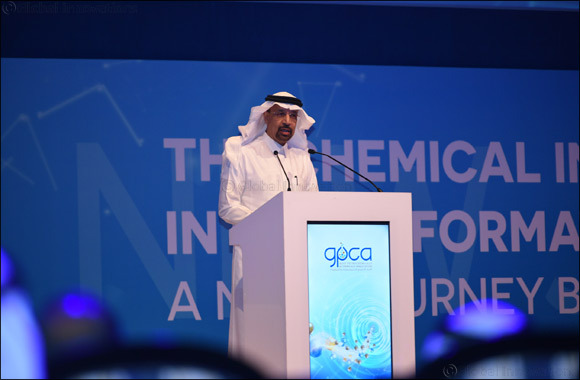 Dr. Abdulwahab Al-Sadoun, Secretary General, GPCA, said: “In a global economy that is increasingly competitive and customer-focused, chemical companies can no longer depend on volume to drive growth, but given our region’s advantaged feedstock we are still better placed to diversify into value-added products. On Day One, 28 November, Hariolf Kottmann, CEO, Clariant and President, Cefic and President, International Council of Chemical Associations delivered the keynote address and participated in a panel discussion with Yousef Al-Benyan. Neil Chapman, President, ExxonMobil Chemical Company and VP, ExxonMobil Corporation discussed growth, responsibilities and sustainable chemical solutions within the industry. Bhavesh V. (Bob) Patel, CEO and Chairman, Management Board, LyondellBasell spoke about how the industry beyond cycles to long term investment decisions. Dr. Markus Steilemann, Chief Commercial Officer, Member of the Board of Management, Covestro Company outlined how the region can incorporate today’s megatrends in its transformation. On Day 0, a student seminar powered by Borouge was held as part of GPCA’s Leaders of Tomorrow initiative, including sessions on career opportunities within the sector. With over a hundred students in attendance, this marked the fifth and largest Leaders of Tomorrow seminar to date. Leaders of Tomorrow (LOT) is an initiative by GPCA together with its stakeholders that aims to bridge the gap between academia and the industry and promote STEM education. With its first edition launched during the Annual GPCA Forum in 2016, LOT aims to gear students up with the hands-on experience and skillset required after graduating from universities and starting their career in the industry.